Alyssa Kincaid knows she needs to make some big changes. A move to San Francisco is the first step, and now it's time to get serious, and to get the rest of her life on track. If only her messy life would cooperate. And if only it had Joe Hartman in it. Joe knows all about pain, and not much at all about love. But he's clear on one thing: Making a move on his best friend's little sister, the beloved youngest sibling in the closest thing to a family he's got, would be asking for trouble. Unfortunately, Alyssa always does seem to be asking for trouble. And it's getting harder and harder for Joe to resist answering. Note: Despite the fog, San Francisco does get pretty hot at times. If you prefer your romance without steam, this may not be the audiobook for you. 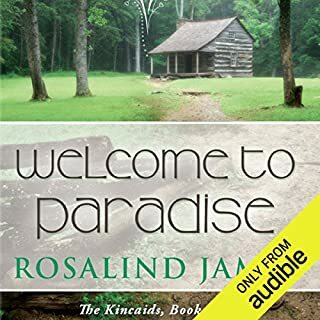 ©2014 Rosalind James (P)2015 Audible Inc. This is my favorite of the 3 book series. I've read the book a few times and wanted to purchase the audio to put life to it. Joe and Alyssa have known each other for 15 years. 15 LONG years for both of them as they secretly had feelings for one another. Joe is very closed off and doesn't show much emotion. Alyssa is a funny, energetic character and she certainly brings life to Joe. With a little help from Alyssa's brother and sister-in-law by going on a ski trip, Joe and Alyssa finally, finally come to terms with their feelings. And from there on, there is much passion and steam and compassion and hardships. It's an emotional roller coaster at the end, but they help each other and are able to overcome it all - together! Rosalind is such a great story teller and brought so much emotion to this story. Joe had a tough life and I believe she made the reader understand how hard some people's lives truly are. I was a bit disappointed, however, in the narration. I do agree with some reviewers that the female parts were great, but I was so looking forward to hearing Joe and I was disappointed in the voice for him. I felt it was very mature sounding. In my mind, he did have the tough persona, but this voice just didn't do it justice for me. Rosalind James is one of my favorites. I've read most of her books and will continue to do so but this is her weakest series and this 3rd installment was just meh. Too much petty drama and lectures. I’m a huge fan of Rosalind James. Her books are so addictive. I usually read her books first and then when I get the chance to listen to them on audio I go back and read along with the narrator. This time was a little different for me. I had never read this book and went straight into audio. I felt a little lost without following along. This was also the first time I had heard this narrator, so it took me a while to get use to her. But………I have to say, “Asking for Trouble” was really good. It had romance, humor and was heartwarming, and of course, a little steam, which is always good. I loved Joe right away; I couldn’t help but feel for him. I liked Alyssa. She was a little irritating at times, but nothing I couldn’t get past. I enjoyed their chemistry. For many years, she has been crushing on Joe, but it took 15 years to bring it to light. The relationship was slow going, but in the end was well worth the wait. They seemed to be a perfect fit for each other. * I received a free copy of this audiobook in exchange for an honest review. I was not compensated for my review, and I was not required to write a positive review. The opinion expressed here is my own. 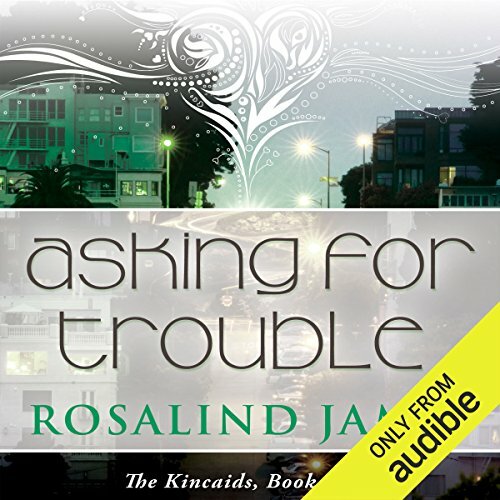 Asking For Trouble by Rosalind James is Book 3 in the author’s The Kincaids series. Is it ideal to listen or read them in order? Probably. Is it necessary, absolutely not! Whether you are listening/reading to this first, second, or third, you are in for a great romantic story. I won’t summarize the premise here; the description for the book takes care of that. I will say that the characters are very realistic (aside a couple being pretty rich, but that is just fun in this case), Alyssa in particularly reminds me of people that I have known over the years. The romantic build up for the characters, and in extension, us the listeners, is deftly done and the anticipation enjoyable. As a pair their chemistry is fantastic and really makes the story great. The description mentions steam, and it is a steamy story. If this is not of interest to you, I will say it is a book you could fast-forward through the steam and still have a substantial story worth your money and time. Their separate backgrounds are interesting and Joe’s in particular is not overdone. I think Alyssa will particularly appeal to listeners/readers who are going through or have been through transitional times like moving to a new city or starting down a new career path. In short most, if not all, of us. Joe is a protagonist who is his own man. He has some demons but they veer into melodrama territory and they are explored in a realistic way. Joe is also a man who can take charge both in life and in a relationship, again without ever overstepping. James also creates fun and suspenseful settings throughout the book. Additionally, the author creates interesting minor characters and work subplots. Reader Emma Taylor is easy to understand. I never had any problems misinterpreting words and she does a wonderful job of putting personality and character into her performance. This book is one I will definitely returning to so I can return to these characters and their story and I wholeheartedly recommend you give Asking For Trouble a try. Asking for Trouble is the third book in the series featuring the Kinkaid siblings. We meet Joe and Alyssa in a previous book, but don't really learn that much about them until this book, so it could easily be enjoyed as a stand alone story. The youngest of the three Kinkaids, Alyssa is trying to get her life together in the shadow of her wildly successful older twin brothers, and makes a big life change by moving to the Bay area from Southern California. This puts her in the same city as one of her brothers and his business partner, his longtime friend and college roommate. The same friend/roommate that Alyssa has had a crush on for nearly 15 years. Joe has always had a thing for Alyssa, but she was always either too young, too far away or too uninterested (or so Joe thought), so he tries his best to be a good friend and an extra, less judgemental big brother. Initially so quiet and reserved, we learn that he is perhaps this author's most layered character to date and you can't help but fall in love with him and root for him to finally get the life he has always deserved. Being a romance, of course they get there eventually, but the twists and turns on the way make this a fabulous story. This was a new narrator for this author's books, and it took awhile to get used to her voice and characters and she grew on me as the book went on. I highly recommend this audiobook if you are a fan of a compelling and sweet love story. At the end of the last book in this series, I felt like we'd be getting an Alyssa and Joe pairing in this book, and what a ride it was. I felt so sad for Joe as the layers of his childhood were revealed and so happy that Alyssa could be there to show him what love really was. I also enjoyed seeing Alyssa mature throughout the book. I didn't expect this story of the Kincaid sister and Joe and was quite pleased with the story line. another great tale to be enjoyed written by Rosalind James. I have just two books by her left to read before the 'no kind of hero' comes out... can't wait. I'm 75 and still preordered it, having faith I will get to read it. I've found a new author and narrator. To bad they don't have cousin that she could write about. Joe had such character. Alyssa as well. The narrator could do those voices and you distinguish in between them. I think I am going to look for more Rosalind James books to listen to. A sweet love story…great vacation reading! Where does Asking for Trouble rank among all the audiobooks you’ve listened to so far? 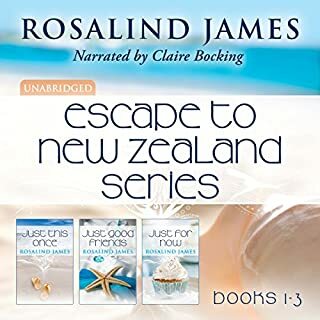 I would actually say I preferred Rosalind James' other series of audio books (Escape to NZ) over this one, but that's because the other series is just so fantastic, it's hard to compare. This one was alright for me - as an audiobook - not bad at all. The story is so well-done! It just took me some getting used to a different narrator. I love the fact that the main characters have known each other since they were teenagers, and have always liked each other. This was an easy transition from friends to romance, yet for Joe, the hero, this was difficult as he had so much at stake if things went wrong. I liked the way the characters grew and changed throughout the story - the way Alyssa went from being impetuous and immature to finding a true purpose and satisfaction in her career, and life with Joe. Steam level is pretty hot so if you don't enjoy that kind of thing, this one may not be for you. It is very tastefully written, and builds up over quite a bit of the story. Would you listen to another book narrated by Emma Taylor? Yes, although, I think she can use a little more emotion with her male voices. The female ones were good, I just think that the other voices need a little more work. It was just hard to get used to a woman reading the male voices. • She does a great job going back and forth between the voices. The scene where Joe went to Alyssa's parents' house to ask her dad for his blessing to date his daughter. I thought it was really sensitive of her dad to help Joe realize there was a pathway to forgiveness for his past. I loved how Joe opened up to him and confessed - and felt relief. Later, Joe tells Alyssa she can come with him to visit the places in Las Vegas that he needed to and she explained that she was there for him - whether he wanted her to stay in the car -- or to come with him each step of the way. She just wanted him to let her in. Her dad had advised him "when you want to close down, open up and let her see you. ", and he did just that. Conclusion: The story concludes with some pretty tear-jerking moments and I'm so happy these two worked things out in the end. The struggles they dealt with were very realistic and I hope you will discover and love these characters, and the story as much as I did. What made the experience of listening to Asking for Trouble the most enjoyable? I love Rosalind James books. This series was great. The characters were well drawn and very likable. I liked Joe. He was strong alpha male and well written. What about Emma Taylor’s performance did you like? Her command of different voices was good, and this is really important to make an audiobook enjoyable for me. Thoroughly enjoyed this entire series.